Barry Melton was a co-founder (with Country Joe McDonald) of the legendary San Francisco psychedelic band Country Joe and The Fish, who went on to perform at Woodstock and became a seminal part of the 'Woodstock' movie. 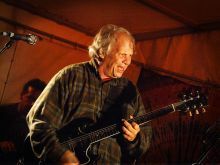 Barry Melton entered music in his teens, in San Francisco, as a member of the Instant Action Jug Band, which was where he met Country Joe McDonald, a singer and guitar player who was also putting out an underground newspaper called 'Rag Baby'. The two worked together on some of Joe's recordings in support of his political journal, and out of that linkup they decided to form a band - the resulting group was christened Country Joe and The Fish. Barry's lead guitar - a searing psychedelic assault on the strings - was as essential a part of the group's three classic albums as Joe's voice. Amid numerous personnel changes, especially after the third album, Melton & McDonald formed the stable core of the band, which lasted into the late '60s. Melton held the group together after Country Joe McDonald went solo, and he brought ex Big Brother & The Holding Company members Peter Albin & David Getz aboard when they were left high and dry after Janis Joplin left the band. Working as Barry the "Fish" Melton, he continued as a solo act through the 1970s and into the 1980s, also fronting the Barry the "Fish" Melton Band. Their Irish tour is a rare chance to see the greatest of the psychedelic guitarists of the era in action.